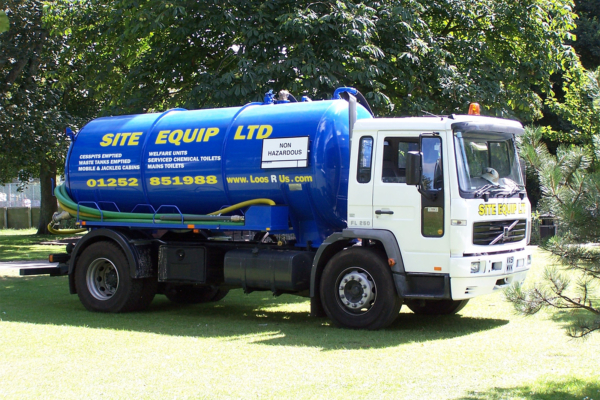 Site Equip offer Septic Tank emptying services from 10 gallons to 2,800 gallons of waste. We offer emptying services for large toilet blocks, this is often for construction sites where there is a toilet block or cabin situated over a large waste tank for long term projects. For these toilet blocks, we use our 26T vacuum tankers which can hold large amounts of waste which means it only takes one visit to site. We are able to service sites with difficult access with our fleet of smaller 3.5T and 7.5T tanker vehicles as well as some 4×4 defenders for the trickiest of sites. Why order your liquid waste removal from Site Equip? Professional Service, our liquid waste removal service is the best in the UK, with our our service operators completing their Level 1 National Sanitation Qualification and two winning service attendant of the year! We can offer this service on a daily, weekly, fortnightly or monthly schedule. Alternatively, you can hire our emptying services on an ad-hoc basis. Please get in contact if you would like to find out more about our septic tank waste removal services. You can call our friendly sales team on 0800 371994. Please enter any other information relating to your enquiry here.